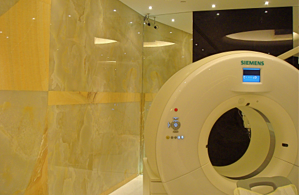 The Art of the Heart … slice and dice state-of-the-art technology paired with the symphony of natural stone at Tan Tock Seng Hospital. When the ticker needs some help and you need a clear, detailed picture of your heart, your doctor will probably suggest a Computer Tomography (CT) Scan, which is basically x-raying in slices, the machine rotating around the body as it scans and records, scans and records, compiling multiple images from multiple angles, which it then renders as a composite whole, a picture put together from the many scanned images. 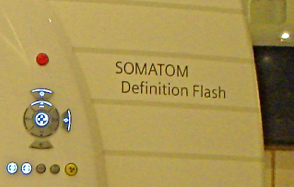 The SOMATOM Definition Flash CT in the Nuclear Cardiology department of TTS Hospital is the most recent model from Siemens, one of its kind in South East Asia. It can scan any organ in any part of the body and it can scan the heart twice as fast as current models, in a fraction of a heartbeat – all this without the patient having to hold his or her breath. It requires a very low dose of radiation (down by as much as 93% from current levels), which is three times lower that the background radiation a person naturally absorbs in a year and with this low level of radiation, is able to render high resolution pictures with greater clarity and contrast. Coronary arteries, aorta, heart valves, heart functions, weak and bulging walls of blood vessels (aneurysms), blood clots (pulmonary embolisms), layers of the artery wall peeling away (dissections) … even diseases in the pericardium, that sac around the heart; all these are detected, revealed and laid bare by the SOMATOM – enabling early detection and diagnosis and opening up the possibility of using CT scanners for routine cardiac examinations. 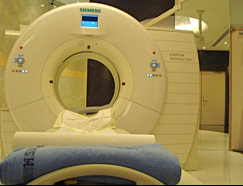 This patient-friendly cardiac imaging is suitable not just for those who can stand the discomfiture of radiation and scans, but also for older patients, the elderly, children, emergency cases and patients in the ICU, opening up the beneficial effects of its technology to a wider swathe of people who may have earlier been unable to endure the rigour of the procedure. And now, the art part, the art-of-the-heart part, where interior designer Alvin Wee has used natural stone for the physical space around the SOMATOM to create a naturally comforting and easeful environment. 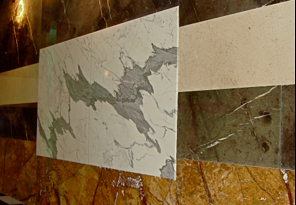 The colours evoke moods, the browns and yellows, the limpid translucence of white and golden onyx, sweeping elements of yin and yang, lava stone for its properties of absorption, marble floors that suggest a sensation of walking on clouds, mirrors that extend and reflect space, a recessed dome in the ceiling, its circular curvature matching the shape of the machine. The aesthetics of the décor alleviate the gravity of the medical procedure, perhaps lightening the awareness of this being a hospital and/or an emergency (though the scan is important enough to warrant thoughts of life and death), the colours and spatial manipulation cleverly showcasing the equipment, pleasing the eye and the senses, a series of unfolding and reflected triptychs in light and stone. 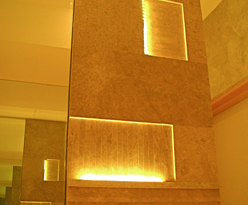 In the Waiting Room is tiger travertine from Turkey, a whole wall of unbroken stone, replicating a waterfall and spot lit. The upholstery is in a vinyl that looks like fabric, easy Mediterranean colours of olive, green and rust. 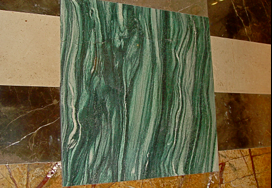 A slab of stone, a crazy horse, a wild horse, this is a painting in itself, this piece of marble, showcased and highlighted to tease the imagination. Diffused lighting in the scrub room lends a restful glow and the lamps have no switches, no sharp edges, responding with light to the touch of a hand, the drawers have no handles, opening and closing to gentle movements and nudges of a gowned hip. These are rooms that match the machine, that complement the nuances of applied engineering, a meeting of logic, art and craft; each element working in harmony to put the patient at ease and enhance his comfort. The care and attention given to synchronizing man, machine and milieu brings its own reassurance when the body is frail and the spirit restless and perhaps, unquiet.